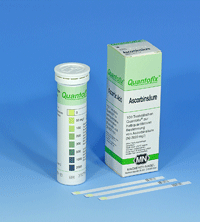 These test strips are for the rapid and reliable determination of ascorbic acid / vitamin C in food. The test strips' easy dip-and-read-procedure provide reliable results within 30 seconds. QUANTOFIX? Ascorbic acid test strips allow the quick and easy determination of vitamin C in fruit juices as well as on fresh cut surfaces of fruits and vegetables. 100 strips, gradation 0 ? 50 ? 100 ? 200 ? 300 ? 500 ? 1000 ? 2000 mg/l Ascorbic acid / Vitamin C.